This day has been coming for a long while now. When Trinity first appeared on the market, it was in laptops as the A10-4600 in mid-May. A few weeks later S|A learned that the desktop version of Trinity was going to be delayed, and here we a little over a quarter later on the precipice of enjoying desktop Trinity and the raw power that 100 Watts worth of performance that it can bring to bear. The catch, of course, is that this is but a preview. Our own Charlie Demerjian has covered the speeds and feeds half of this preview, and yours truly is here to address the performance aspect. AMD sent us two APUs to review. 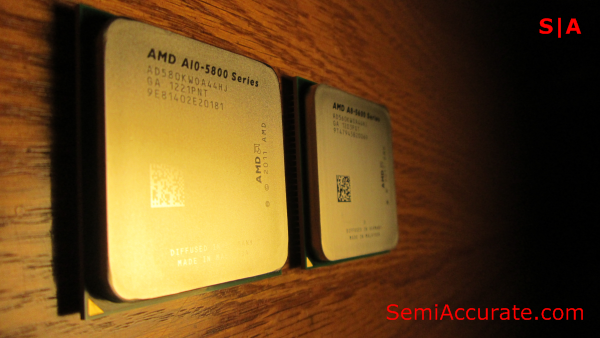 First up we have the A10-5800K, which is the highest performing part in the A-series lineup. Then we have the 5600K, which loses 200Mhz of CPU clock speed, 40Mhz of GPU clock speed, and has only 2/3rd’s of the GPU cores that the 5800K offers. Now if those sound like some pretty drastic cuts, that’s because they are. But the thing to keep in mind here is that the 5800K has a base clock speed of 3.8Ghz, a base GPU clock speed of 800Mhz, and 384 GPU cores. This is a formidable amount of raw power for AMD to whittle down into low-end models while still keeping very respectable performance. 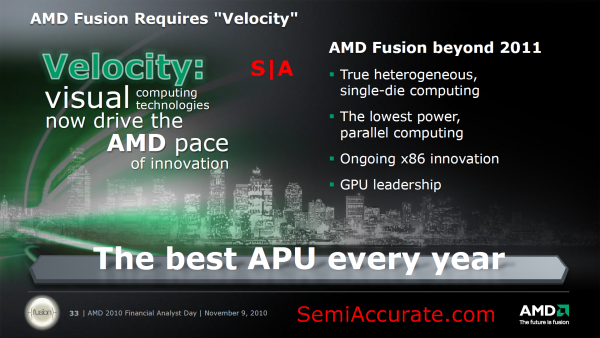 I’m hoping some of you will still remember this little gem of a slide from AMD’s 2010 financial analyst day. Velocity is what AMD called it’s yearly APU update strategy shortly before the first APU was released. And while AMD quickly moved past this term, the goal of having the best APU every year is something that AMD is still very focused on. Arguably, AMD has had the best APU every year. Granted it’s only been two years, but AMD has offered APUs that take advantage of the benefits of integration by offering markedly faster integrated graphics, and significantly lower power consumption than traditional solutions. The two major sticking points that have kept AMD from unequivocally having the best APU, are supply issues and CPU performance. The supply situation seems to have finally worked itself out with Trinity, and is now a far cry away from the low yielding hardships of this time last year. Global Foundries and AMD also renegotiated their contract in March of this year leading to improved relations between the two. 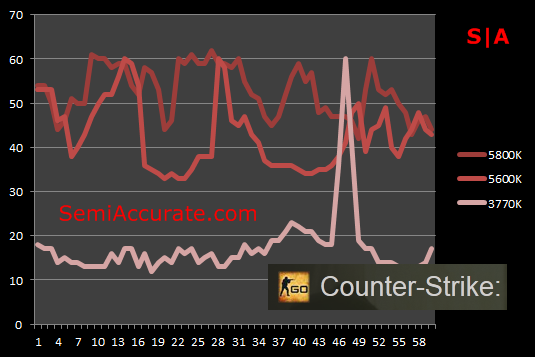 In terms of CPU performance, AMD has made some confident strides forward with its Piledriver core, but as has been widely reported, it still lags significantly behind Intel’s Ivy Bridge. Just to recap some of the changes and abilities of the A-series chips we’ll be testing today, I’m bringing out this slide. The big advancements that Trinity brings are new CPU cores, new GPU cores, and iterative improvements to the supporting hardware. All of the games in our suite were run at a resolution of 1080P, with DX 11 enabled where applicable, and the in-game quality settings that we chose were the highest that we felt were playable on the 5800K. Battlefield: Bad Company 2 is the first game we tested with. 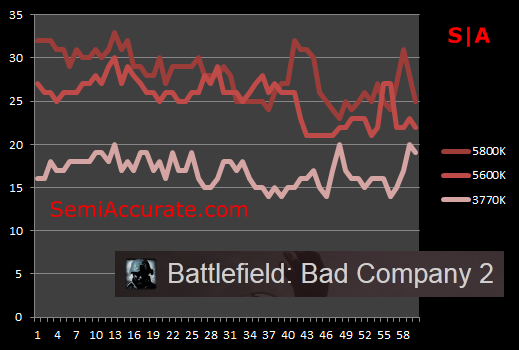 We were able to turn everything up to high in BFBC2. But HBAO was just too much for Trinity to handle, despite this, the game still looked quite good. WTFLOLBBQ however could still not be turned on no matter how hard we tried in BFBC2 even with HBAO off. Comparing frame rates, the two AMD CPUs were almost double the speed of Intel’s 3770K and it’s HD 4000 GPU. The 5800K is also notably faster than the 5600K as well, particularly in Bad Company. I could feel the difference in game play fluidity between each of our three contenders, even if the gap between the top two seems small. Moving on to Valve’s Counter-Strike: Global Offensive, we were able to max out absolutely every quality setting this game had to offer on the 5800K. 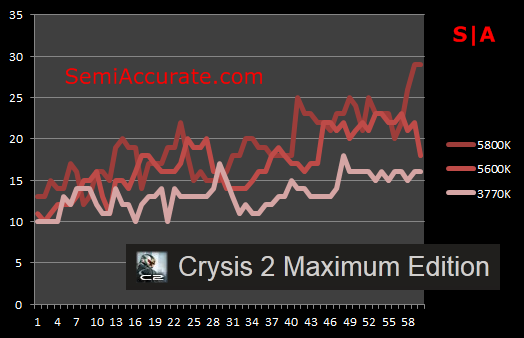 Frame rates were totally playable on both of AMD’s APUs, but the Core-i7 3770K was just unable to keep up. 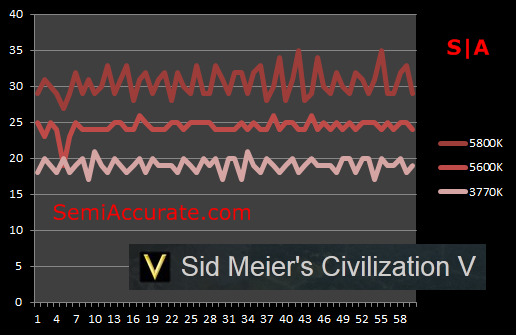 The large spike on the graph is the point at which my terrorist character met his untimely, and rather choppy, demise. It is also worth noting that AMD is cruising along at almost three times the frame rate that the Intel HD4000 GPU can deliver. 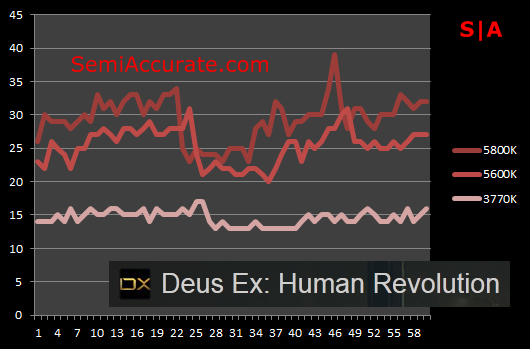 Deus Ex was another title that ran quite well on the 5800K. 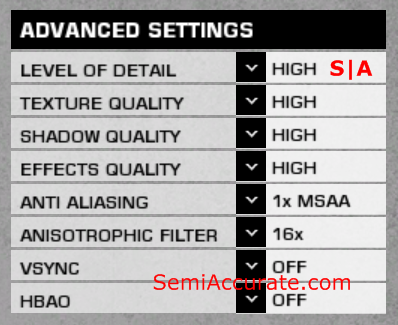 Again were we able to turn most of the settings to high, with the exception of SSAO which remained at normal. The gap in performance between the 5800K and the 5600K is surprisingly small considering how many GPU cores AMD fused off. 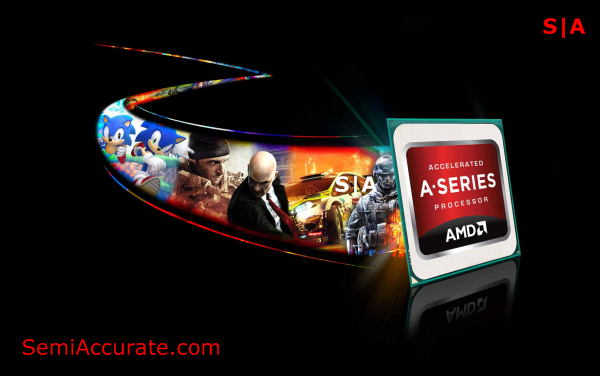 In this particular game AMD’s top-end Trinity offers double the performance of Intel’s top-end Ivy Bridge part. 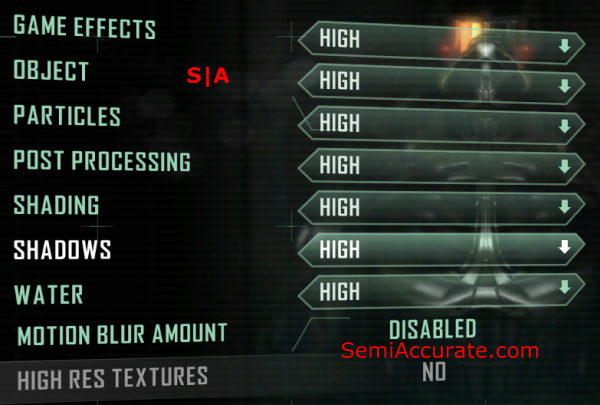 Moving to the hardest benchmark in our suite, Crysis 2, we’d like to note that if we could have turned the settings any lower, we would have. But that the game was still reasonably playable on the 5800K at these frame rates. It seems that we’ve fallen into a rather predictable pattern in these benchmarks, with Intel’s 3770K failing to challenge AMD’s 5800K. In Civilization V we were able to set everything to high, in DX 11, and even enable the High Detail Strategic View option. This benchmark had each of our contenders spaced about five frames per second apart. So if 384 GPU cores gets you 30 frames per second, and 256 GPU cores gets you 25 frames per second, would having only 128 of AMD’s GPU cores bring performance down far enough to match the 3770K? We’d need a A4-5300 to find out, but judging by how far AMD has castrated it’s bottom-of-the-line offering, I’d be surprised if it could still match Intel’s top part in graphics performance. 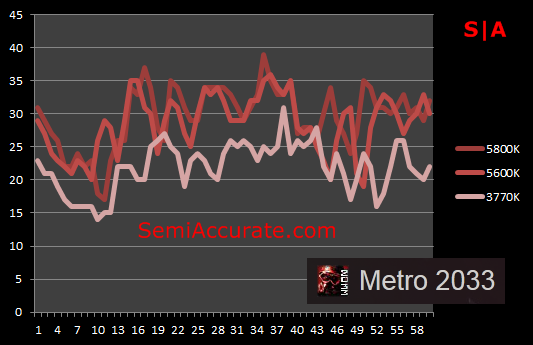 Moving on to our last benchmark, Metro 2033, we were forced to use the low preset to get playable frame rates. But we were able to max out the texture filtering setting. Looking at the numbers it’s clear that AMD’s two chips are neck to neck, and probably being bottle-necked by something other than raw GPU horsepower. The 3770K is once again bringing up the rear. Overall a few things have become very clear in our testing. AMD’s A10-5800K is fast, I mean really fast, for an on-die GPU. It often offers between 1.5 and 2 times the frame rates that the Core i7-3770K can muster at the most common display resolution for gamers, 1080P, according to Steam’s hardware survey. Another thing that’s become clear is that just like the top-end Llano chip, the A8-3870K, Trinity’s top-end model, the A10-5800K is not bottle-necked by raw GPU horsepower. Rather something else is keeping it from putting more distance between itself and chips that have only 2/3rd’s of the GPU horsepower, like the A8-5600K. This is something I’ll be looking into in later articles, but if I had to put my money on any one culprit, I’d have a split jury. The 5800K’s performance is either being capped by it’s 100 Watt thermal envelope, or by a lack of memory bandwidth to feed its 384 GPU cores with. 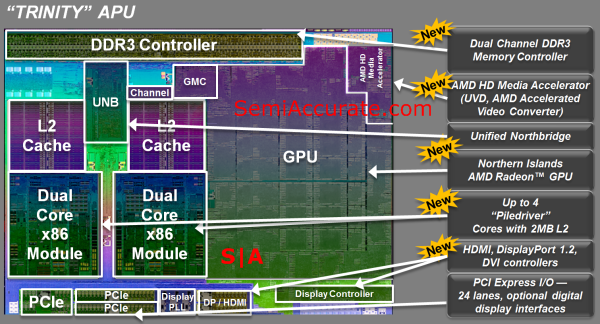 But this is a small point of interest that can be resolved with just a little foray into overclocking the chip. Alas, AMD has asked us to refrain from publishing overclocking and CPU side benchmarking results until 2nd of October. The clearest thing that our testing has shown is how far on-die GPUs have risen in terms of performance. When Llano was announced many analysts began predicting the imminent death of the low-end discrete GPU market. But now with Trinity I wouldn’t be surprised to see APUs and Intel’s next generation chip, Haswell, to start to edge into the space that we currently consider the mid-range GPU market.